- Publisher One of the chief tasks facing the interpreter in any investigation of Second Temple Judaism involves sorting out the relationship between Judaism and Hellenism. How much influence did Greco-Roman culture exert on Diaspora Judaism? To what extent did Hellenism affect the material culture of Judaism and its social and religious practices? Hebrew University professor Lee Levine looks at literary, epigraphical. and archaeological evidence in an effort to sift through the relevant issues. His assessments argue against oversimplification and instead encourage a more nuanced and balanced view. This volume not only introduces the fundamental issues but supplies an informed reading of the sources as well. Anyone wrestling with the relationship between Judaism and Hellenism will find this essential reading. About "Judaism and Hellenism in Antiquity"
One of the chief tasks facing the interpreter in any investigation of Second Temple Judaism involves sorting out the relationship between Judaism and Hellenism. How much influence did Greco-Roman culture exert on Diaspora Judaism? 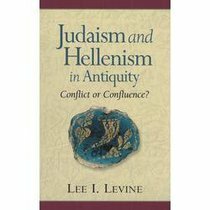 To what extent did Hellenism affect the material culture of Judaism and its social and religious practices? Hebrew University professor Lee Levine looks at literary, epigraphical. and archaeological evidence in an effort to sift through the relevant issues. His assessments argue against oversimplification and instead encourage a more nuanced and balanced view. This volume not only introduces the fundamental issues but supplies an informed reading of the sources as well. Anyone wrestling with the relationship between Judaism and Hellenism will find this essential reading.